A challenge hurling match and a return game played between Galway Woollen Mills, Newtownsmyth, and the Post Office was the seed that led to the inauguration of an inter-factory hurling competition. A meeting was held in the CYMS in February 1954 and the following committee was elected: Jimmy O’Connor, GPO, chairman; Tommy Connellan, CIE, secretary; Tom Mooney, the Hat Factory; Sean Duggan, ESB; Sean O’Connor, Galway Woollen Mills; Jimmy Duggan, O’Gorman’s; Paddy Purcell, Sisk’s; Mick McGrath, AA Stuart’s; and Cronan Treacy, McDonoughs. The competition was an immediate success even though there were very few factories in Galway at the time. Some 18 teams took part, and huge crowds of spectators turned out to see the games, but sadly it all petered out in 1959. But not all was lost. Another group came together in 1968 with Jimmy O’Connor in the chair and Christy Fitzgerald, CIE, as secretary. Kevin Blayney of McCairn’s Motors was the first sponsor, and again the competition was an instant success. The first final was played in the Sportsground between Crown Control and Roadstone. Happily the inter-firms competitions are still played with great enthusiasm. The team we have for you today represented Galway Textile Printers in Division 4 of the league in 1975. They beat the Post Office team in the final by a score of 3 – 4 to 2 - 5. 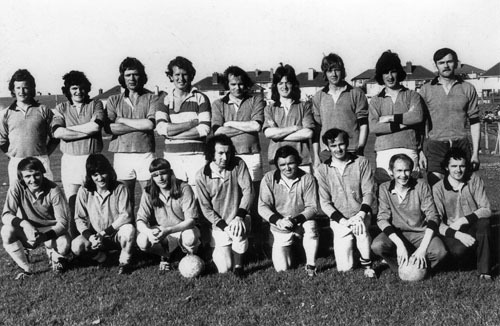 They are, back row, left to right: Tony Dilleen, Pake O’Connor, Bill Delaney, Colm O’Brien, Michael O’Connor, Bernard Concar, Gerry Lynskey, Michael Walsh, and Michael Hackett. In front are John Cleary, Mickey O’Sullivan, Jimmy O’Sullivan, Michael O’Connor, Paddy McDonagh, Henry O’Connor, Martin Cooney, and Tom Glynn. Galway Textiles did not have enough players to make up a team so they had a few ‘imports’. Great weather, an enthusiastic crowd, and two very sporting teams generated a great atmosphere for this final. Textiles had an own goal, squandered many chances, and looked anything but confident at the break, but they settled down on resumption and with captain Jimmy Sullivan, and John Cleary in control at midfield, the tide turned quickly in their favour. Their two point margin was almost gone when Post Office netted only to have it disallowed for an infringement, and the final whistle sounded shortly after. Best for the winners were Tony Dilleen, Gerry Lynskey, Bernard Concar, John Cleary, Michael and Jimmy Sullivan, Henry O’Connor, and Martin Cooney. Seamus Ó Fatharta, Sean Coyne, Jackie Fox, John Diskin, Ray Durnin (who scored 2 – 3 ), Mick Forde, and Cyril Foye were best for Post Office. Tom Durnin, manager, Essential Cleaners, presented the trophy to the winning captain, and the referee, Gerry Mahony, was presented with a marble plaque. Galway Textile Printers was probably the largest industry in Galway in the ‘50s and ‘60s and yet there seems to be very few photographs of either the building or the staff around. If any readers have some, I would be very interested in seeing them. This photograph is one of the many that appear in St Patrick’s Parish Annual, which has just been published. It is, as usual, edited by James Casserley and contains a lot of parish information, history, and fun. This annual, which is available in local shops, has been published for more than 20 years now, and when you put all of the issues together you are looking at a significant amount of local history, folklore, characters, tradition, etc.